Pay with your credit card via Stripe. #1 Trusted Source For Secure Payments. *Personal info such as credit card info is not stored on our site. This information is stored on credit card processing companies Stripe and PayPal. We use top of the line security such as Wordfence and we also have a standard industry issued SSL certificate to protect all of your information. The term ‘Urban Money™’ or ‘us’ or ‘we’ refers to the owner of the website. The term ‘you’ refers to the user or viewer of our website. This website and its content is copyright of Urban Money™, LLC- © Urban Money™ 2015. All rights reserved. Urban Money™, LLC is committed to ensuring that your privacy is protected. Should we ask you to provide certain information by which you can be identified when using this website, then you can be assured that it will only be used in accordance with this privacy statement. Urban Money™, LLC may change this policy from time to time by updating this page. You should check this page from time to time to ensure that you are happy with any changes. This policy is effective from 9/1/15. There are no refunds on online classes. Once you purchase is completed, you will have access to your class(es) for 7 days. However your feedback is warranted. We are continuously looking to improve our classes. The information provided in our classes are for educational & informational purposes only. The reader is responsible for his or her own actions and the author (Urban Money™, LLC) does not accept any responsibilities for any liabilities or damages, real or perceived, resulting from the use of this information. It is important for you to know that investing is risky and that you can lose all of the your money. If you are uncomfortable with investing your own money, please consult with a professional. Stocks, bonds, options, and other securities involve risks and are not suitable for everyone. Investing can be speculative in nature and carry substantial risk of loss. Only invest with risk capital. We do allow advertisers to promote their services our our site. However, you are not required to use these services at any time. What is your t-shirt return policy? Print Aura team (via Urban Money™) will review replacement/return requests for the following issues: faulty product such as a hole in a product, a print error by PrintAura.com relating to quality or incorrect image if it is PrintAura.com’s (via Urban Money™) fault. To receive a replacement you are required to provide a photograph so we can review the issue. Print Aura (via Urban Money™) is not responsible for incorrectly provided addresses that result in lost or misdirected packages. If packages are returned to us for any reason and need to be reshipped there is a $5 reshipment fee AND the cost of the shipment. Size exchanges or general returns/exchanges are not the responsibility of PrintAura.com and sellers must resubmit and pay for this type of order. Print Aura is not responsible for 3rd party delivery delays or lost packages. PrintAura.com will provide a tracking when available but it is up to the seller to track down or contact local postal service to track any lost or delayed packages. Orders can be updated when in status as NEW. Once the orders have gone into PROCESSING they can not be edited or canceled without written request. Because all products blanks are ordered custom daily, canceling an order that is processing may still result in fees for either blank products or for the full printed products. Canceled orders that have not been shipped whether printed or not can not be stored or saved for future orders. The site is for informational purposes and is only a resource of information. This site was not designed to give you financial advice to take financial action. If you are interested investing, it is suggested that you do your own research and educated yourself. You also can speak with a financial professional. Urban Money™, LLC is not a licensed broker-dealer, stock promoter, market maker, investment advisor, nor are we underwriters. All information provided by Urban Money, LLC is for educational and informational purposes only and should not be construed as an offer or solicitation of an offer to buy or sell securities. More importantly, investing in stocks or any penny stocks involves high risk of loss. All investors should seek the advice of a chartered financial analyst or other financial professionals before investing. 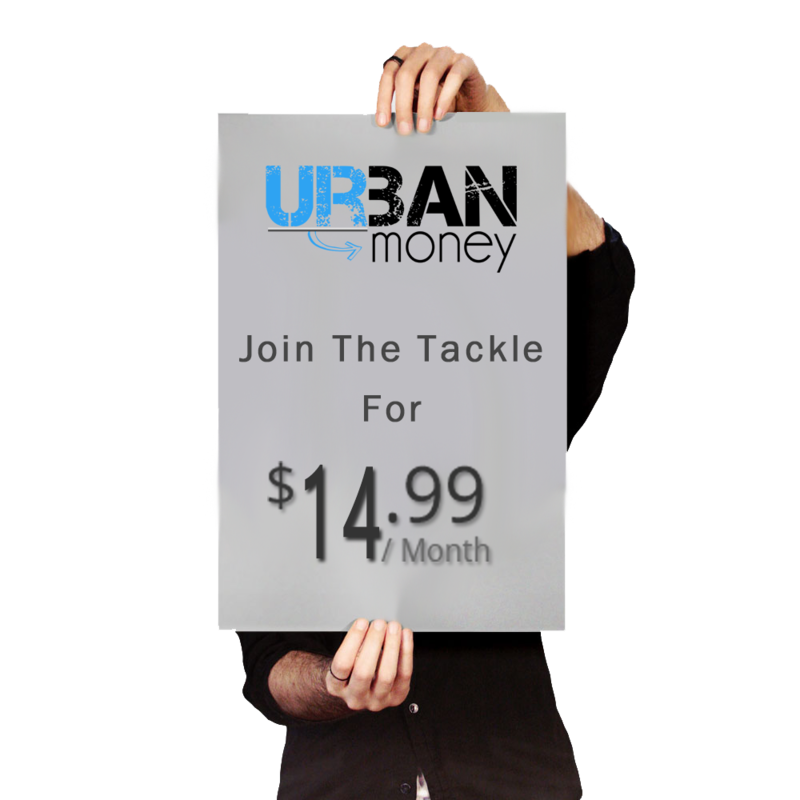 The Tackle membership is billed on a yearly, quarterly, or monthly basis. You can cancel at anytime. You may request a 100% refund if you cancel within 30 days of your purchase date. Referral payments are not paid on referrals that cancel within the first 30 days. Referral payments that are valid are paid on the last day of each month.